A second half goal blitz from Chelmsford blew the Crusaders away as six different players scored for the away side. The first half was a much closer affair. Chelmsford started strongly and dominated the opening 20 minutes and should have gone ahead on 3 minutes when Rhys Murphy swept the ball wide in front of goal. Thereafter Hungerford gradually grew into the game and began to enjoy more of the ball without really threatening the visitor’s goal. Both sides had chances from free kicks in promising positions but failed to test either goalkeeper before Chelmsford eventually got their noses in front on 35 minutes from a superbly struck free kick from Joe Anderson that flew into the net. The second half was a different story as Chelmsford quickly doubled their lead with a 25 yard shot from Captain Antony Church and that quickly became three and four nil as first Rhys Murphy and then Michael Spillane scored on 56 and 59 minutes. The visitors were now in total command and Hungerford’s miserable afternoon became even worse when Captain James Rusby was shown a second yellow card for a high tackle. 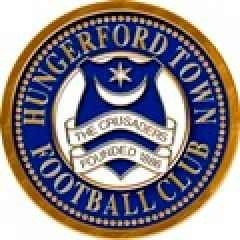 Harvey Bradbury almost grabbed a consolation goal for Hungerford but shot over when through on goal and a penalty from Scott Fenwick followed by a goal from Tommy Wraight completed the rout and three deserved points for a rampant Chelmsford.